How do I start clicker training? How long should a clicker training session last? How long have you been clicking training? 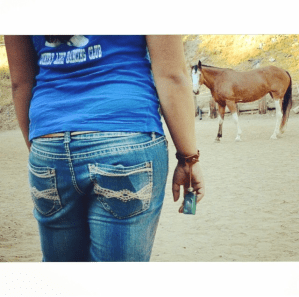 Can all horses do clicker training? What if I don't do tricks with my horse? How does clicker training help with horses' everyday lives? Clicker training is a method of training animals that involves the use of a clicker (a small handheld object that makes a clicking sound when pressed). You first must associate the clicker with a reward, usually a small treat. Once this association is established, the animal will know that when he/she hears the click, they did something good. It is a type of positive reinforcement, makes it much easier to trick train pets, and can be combined with any other style of training. First thing's first: you want to accustom the horse to the sound of the “click”. You can do this by “clicking” and feeding a small treat. Doing this a couple times before you start asking them to do something establishes the association between the click and a reward. Never allow them to become grabby for the treat! You can avoid this in the beginning by only giving the treat by reaching out to them, never allowing them to take the treat by reaching for it towards you. If they do start grabbing for it, and it more than likely will happen, just patiently wait until they stop grabbing before you offer the reward treat. Its best to get this behavior under control early, because withholding the reward during a more complex learning process will only be frustrating to the horse! Timing is crucial! You want to click immediately as they are exhibiting the desired behavior. Not after, not before, but right when they do it! And you must be consistent, or risk prolonging the learning process and creating a frustrating experience for both parties. Here are some posts that will help you get started: Getting Started. It depends on you and your horse, and where you are in your training. When you're first starting, training sessions should be kept short (less than 10-15 min). As you both become more comfortable with the clicker, you can make your sessions longer. The best way to determine how long to make a session is simply to pay attention to your horse. She (or he!) will tell you when they are getting bored, disengaged, or frustrated! Lauren: I started with my dog when I first got her, but she's a chihuahua mix and was afraid of the clicking! So I didn't get very far with it then. I really started a few months after I got my first horse, May, in 2009. We trained almost all of her tricks using the clicker, and she had quite a repertoire of tricks by the time I had to sell her. I have used clicker training with Moxie, my current horse, from the first week I had her. Rachel: I always wanted to try clicker training, but just never quite got around to buying a clicker. Then in 2013 Tucker reached a point where he really wasn't learning new things very well, as we were trying to learn more complex "tricks". He also lacked enthusiasm when it came to play sessions! So I got myself to actually purchase a clicker, and the first time I used it Tucker learned what it meant AND how to nod "yes", it was amazing! There was no turning back. I now use the clicker with my dog and cats as well. All horses CAN learn from clicker training, however the rate of learning and the amount the horse enjoys it will vary. It also greatly depends on your ability, as a trainer, to develop confidence with using the clicker. So just keep practicing, and sooner or later it will become natural for you! Clicker training can help in all sorts of situations, not just trick training! You can use the clicker when doing groundwork to improve your horse's manners in-hand, as well as under saddle to give more clear praise for correct movements. A clicker is so conveniently sized that it can fit easily in your hand even when you're holding a lead rope. You can even tie it to your wrist for convenient on-the-go mobility! Using clicker training will improve your horse's confidence in scary situations like trailer loading, wash racks, and desensitizing exercises. Lauren: From my own personal experience, I've noticed that horses tend to become much more relaxed and motivated to work with you when you incorporate clicker training into your routine. They get to experience success, which puts them in a "green zone" for optimal learning. I find that if I begin any training session with some clicker training, even if my main plan is to ride, Moxie will be much more relaxed and connected to me. Rachel: Tucker is much more motivated and engaged in our sessions when we use the clicker. I don't even have to use the clicker all the time, but when first learning new things it definitely makes a huge difference in his willingness to try! Instead of performing the messy beginnings of a movement and getting a long "thats it! good boy!" and wondering which exact thing he did in those few seconds it took me to say those words, he knows that what he did exactly when he heard the "click", that was good. That's what he should do again for another click! Trubee cannot learn new things at all without the aid of clicker, he gets so flustered and confused. The clarity of the clicker keeps him grounded, more level-headed. hey, nice blog and great instructions 🙂 I am clicking in Austria 😀 Greetings to you and your horses!